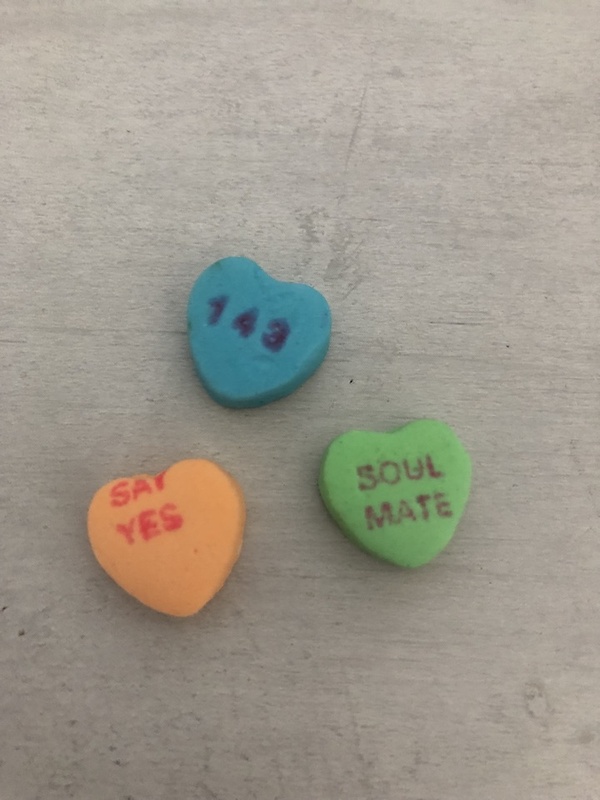 I once bought a box of Conversation Heart candies and on one of the candies was the number 143. I thought it was a typo. I have come to learn that it stands for I Love You. “I” being one letter, “Love” being four letters, and “You” being three letters. Someone had a lot of time on his or her hands to come up with that. Couldn’t it also mean “I can’t run” or “A ripe pea?” All sorts of things. I thought of this because it’s that time of year again, the very pink and red time of year. It’s supposed to be all about love and romance and heartwarming sentiments but let’s face it, Valentine’s Day can be heart crushing too. I remember my days in college when I lived in the dorms and I’d walk past the front desk and see all the floral arrangements that were delivered from boyfriends far away and alas, none had my name on them. The heart is a mysterious thing. It’s a very powerful thing, but at the same time it can so easily be crushed. It holds our deepest desires, our dreams, and our passions, but so often keeps them hidden under doubts, fears, and insecurities. The heart seems to have ears and it can easily respond more quickly to the world’s voice rather than the Creators voice unless we train it. The feminine and the masculine heart are very different. They both however were created to reflect the image and likeness of God. They are designed to bring life not only physically to our bodies but emotionally and spiritually to our souls, if we allow them to, if we awaken them. This Lent, at Firstfruits, we have an amazing series for men and women called Awaken Your Heart’s True Desire. Carol and Tom Sullivan will take us on a journey of discovery through the book Wild at Heart by John Eldredge for the men and Captivating by John and Staci Eldredge for the women. Here is what Carol and Tom have to say about the series. “I desire a battle to fight. I desire an adventure to live. I hope you will consider joining us for this series starting Thursday, March 7 and ending on Thursday, April 11. The sessions run from 6:30-8:15pm. Each week there is a men’s group led by Tom and a women’s group led by Carol. There is also an Introductory talk on Thursday, Feb. 21 from 6:30-8:30. You do not have to attend the introductory talk to attend the six-week series. For more information and to register for either event go to Firstfruits.info/Events or contact Joan at .